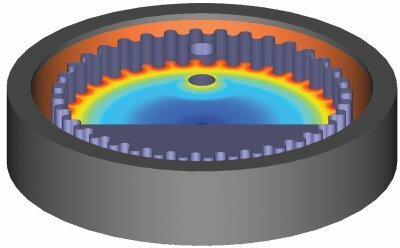 INTEGRATED is able to analyze inductive heating problems through Eddy Current and Thermal analyses. The individual analysis components are combined in a single program so that the power loss computed from eddy current or loss curve analysis is available as a power source for the thermal analysis. In induction heating, the current distribution within the coils will be a function of time. These type of problems require a general time-dependent Eddy Current solver. This solver is available in OERSTED(2D/RS), FARADAY (3D), and INDUCTO.